For those golfers that hit hard with high swings, a divot is usually left behind and you will need a divot repair tool to fix it. Leaving the divot as it is will be typically frowned upon by others and can interrupt the golf balls roll and even land in the divot. 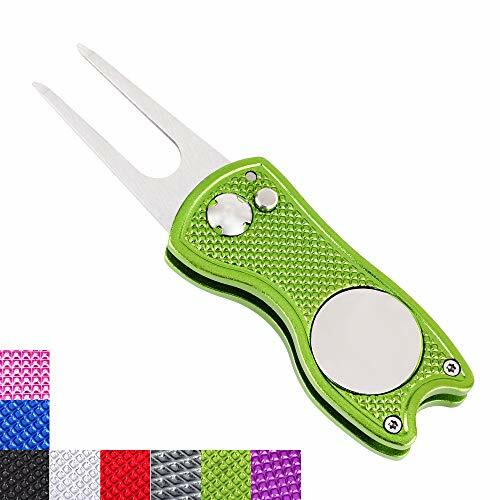 The best divot repair tool is the Birdicorn The 6-in-1 Golf Divot Tool with an impressive feature list and is constructed of lightweight aluminium with multiple colors to choose from for the savvy golfer. In terms of the variety of golf divot tools, there is either one or two prong design with the latter being the most popular. Each prong must be sharp enough to cut through gthe rass in order to repair the divot. Golf divots can come in a range of shapes and sizes but the majority of divot repair tools makes things much easier. Some golfers try to fix them by using their golf clubs or shoes but you will never completely repair the grass as you would with such a tool. Investing into a solid repair tool for divots is more than likely going to last a lifetime unless you end up losing it. For this reason alone, we highly recommend spending a little extra for one thats higher quality. The majority of tools come with a ball marker as an added bonus for keeping track of your ball whilst on the green. Below is a list of the best divot repair tools that will easily repair all types of golf divots. All these are all practical whilst playing a round of golf and come from a simple divot repair tool. The Birdicorn is also constructed from a lightweight aluminum and is available in red, gold and pink. 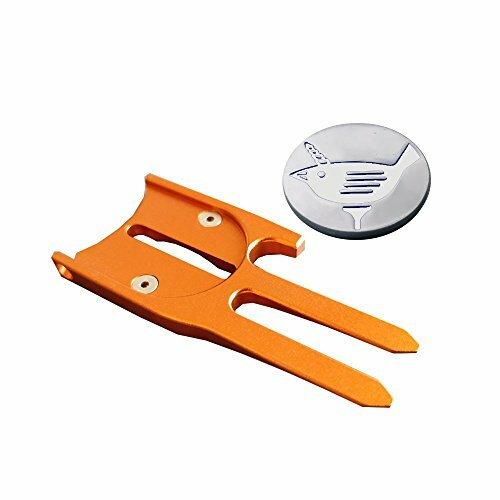 Overall, it is the best divot repair tool that offers a range of uses with the most important use of being able to open a bottle of beer at the end of your round of course. 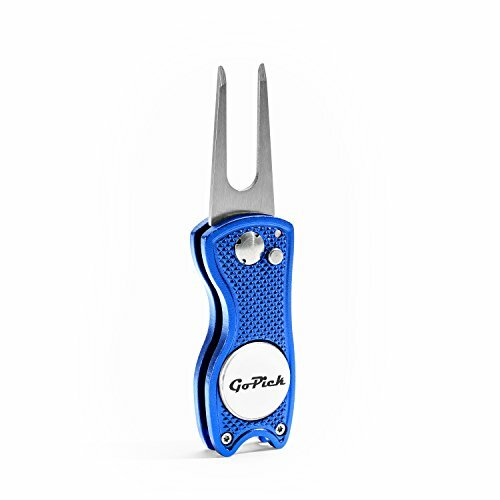 The GoPick divot repair tool is constructed of stainless steel and aluminum and unlike the Birdicorn, it focuses primarily on repairing divots in the ground with an added ball marker. The most desirable feature is the button initiated action switchblade, which avoids the prongs from digging into your pocket or leg. It also features a magnetic detachable ball marker for use on the putting green. GoPick have designed an ergonomic design that is simple, solid and simple to use with no thrills. It is the best golf divot tool for the money and likely to last a lifetime with the stainless steel construction. Many golfers always like to stick to large brand names and Callaway have a divot repair tool for those golfers. It is a 4 in 1 tool that repairs divots, comes with a ball marker, has a nylon bristle brush for cleaning and a metal groove for cleaning tough dirt. 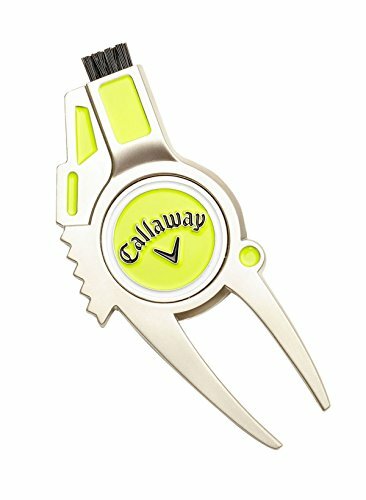 The Callaway divot tool is constructed of a durable zinc alloy and has been designed to be easy to use. It is also the nicest looking golf divot tool but it would have been made even better with additional colors. The Callaway 4-in-1 Divot Tool has some unique cleaning features and has the reputable brand quality of Callaway. It is on the expensive side but a worthwhile investment nevertheless. If carrying around a divot tool in your bag or pocket is too mainstream, why not have it built into your belt? The Ken Rick leather belt is available in black and white with a choice of stitching and a wide variety of waist sizes to fit all. Not only is the divot tool built in but there is also 2 stainless steel ball markers that magnetically attach to the back of the divot tool. The divot tool itself is made from cast aluminum that is made from a special alloy for additional strength. 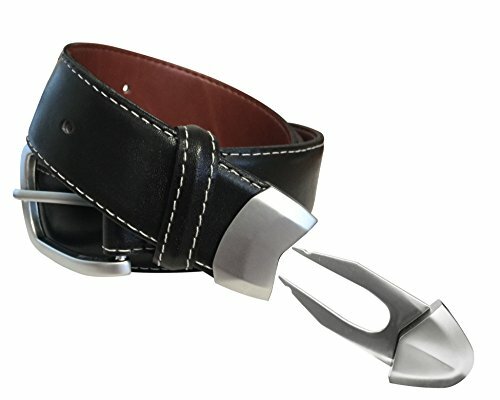 Overall, it is the best golf belt with a divot tool and would make an excellent gift for any golfer. Unlike many of the other golf belts, this is constructed of genuine leather. For those that simply require a cheap divot tool for golf, then the Mile High Life tool is ideal. It is available in 14 different colors and is foldable to hide the prongs, which prevents piercing of your clothes. Included is a magnetic ball marker and the divot tool itself is an all metal construction for maximum durability. Overall, the Mile High Life golf divot repair tool is a simple and foldable device that comes with a ball marker. This is everything that you need in order to repair any divot that you create out on the golf course. A divot repair tool is a must-have for any avid golfer, particularly those who like to hit hard, high swings. 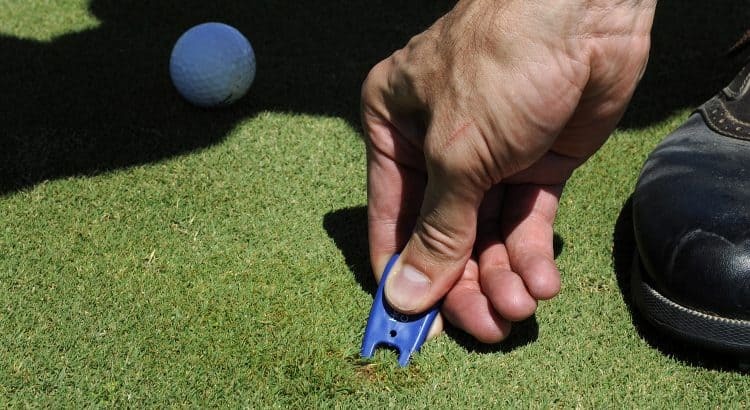 Leaving divots on the golf course is something that’s typically frowned upon, so to keep your fellow golfers happy, you should always carry a divot repair tool that you can use to fix these divots quickly and easily. There are many things to consider when searching for the perfect divot repair tool to add to your golf kit. 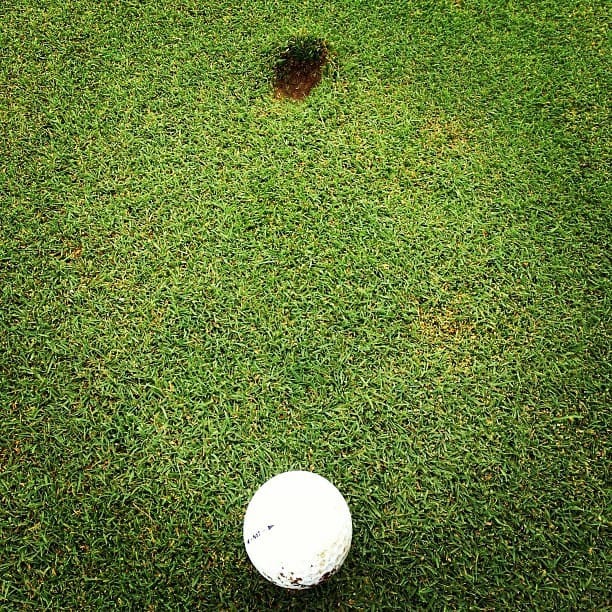 Here’s what you should keep in mind while shopping for your divot repairer. Before you can shop for a divot repair tool discerningly, you first must know how to use one properly. Divot repair tools have either one or two prongs that are pushed into the divot to repair the course. When using your divot repair tool, be sure to push inward with the prongs towards the divot to repair the damage. You’ll need to push down and in at about a 45 degree angle, rotating your way around the edge of the divot. Once you’re finished, be sure to flatten the area out with a putter, which will even out the work you’ve done. This can take some practice, so if you’ve never used one before, it may help to watch a video of how it’s done or even ask a fellow golfer for help. The first thing to consider when purchasing a divot repair tool is the design. There are many small differences between models and brands that can affect your overall satisfaction with the product. The biggest design feature to keep an eye out for is one prong versus two prong tools. Most tools on the market these days are made with two prongs, as this allows for more leverage when repairing the divot and thus makes faster work of the job. Two prong tools are generally best for beginners, although some golf enthusiasts may prefer a single prong tool. Once you’ve considered how many prongs you need, the next thing to look at is the design of the individual prongs themselves. Typically, you’ll want to look for a product where the prongs are quite sharp, as this will make it easier to break into the ground. The length of the prongs is very important as well – too short and repairing the divot will take a very long time, but too long and it’ll be very difficult to move the dirt underground as you’re completing the repair. Another important thing to consider is the quality of the materials and construction used in the divot repair tool. Since the divot repair tool is such an important staple in your kit, you’ll want it to be something that will hold up for years to come. You’ll want to examine the quality of the construction – how well is everything fused together? Will it stand up to wear and tear in your golf bag? 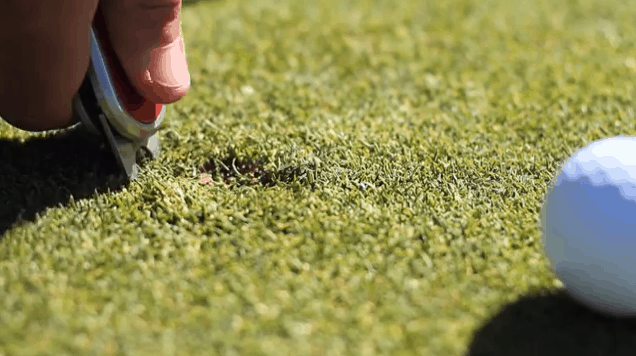 You’ll also want to consider the materials used for the divot repair tool. Ideally, you’ll want it to be made of a strong metal – common materials are aluminum or steel. It’s important to note, however, that steel can rust over time, so you’ll need to keep it away from moisture. Many manufacturers design their products for added practicality when creating their divot repair tools, which is an asset for golfers on the go. For example, many divot repair tools fold up so you can carry them safely in your pocket without hurting your leg on the prongs. This also will help keep your other tools and equipment safe in your bag. Additionally, many companies will build other features into the divot repair tool, such as scissors, ball markers, screwdrivers, cleaning brushes, or bottle openers to make it a true multi-use product. If you can, it may be helpful to test out the divot repair tool before purchasing it to see how easy it is to use. Golf supply stores may have places to give the product a spin before making your final decision. Ideally, your tool will have enough leverage that you don’t have to use too much muscle to repair the divot. This means the tool will naturally move more of the ground up with one push instead of you having to work to do it. If you have a bad back or knees, you may also want to consider a divot tool that has a long end on it, as this will allow you to move the ground and repair the divot without having to lean over so far. If you’re an experienced golfer, you may have some brands of golf equipment that you trust more than others. While this isn’t necessarily a make-or-break factor when determining what type of divot repair tool to buy, it may be a factor to consider if you are loyal to a certain brand. For example, it may be worth it to invest slightly more money into a product that’s made of very high quality construction, contains additional features such as a ball marker, or is easy to use. Some brands may even come with a product warranty or be sold in packs with other golf equipment, which would increase the value added to the product. If you love to golf, a divot repair tool should be an essential in your kit at all times. Keeping your course clean and well-maintained is not only good etiquette, but it will ensure that other golfers respect you. Since it’s going to be one of your most frequently used tools, be sure to invest in a divot repair tool that you trust.